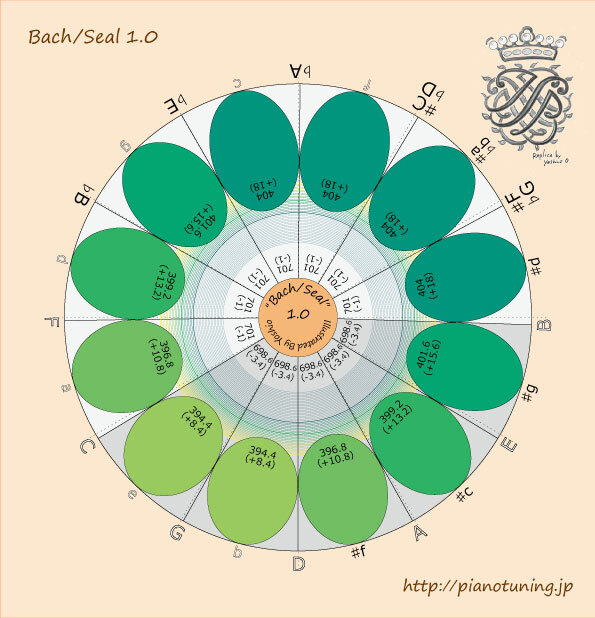 In the tuning system of Bach’s Seal, the crown design shows seven pure 5th (702 cent) and five impure 5th (697.2 cent). I transferred the tonality of this tuning system to the pitch very near to equal temperament. I set seven pure 5th to a little muddy tone (701 cent), and five impure 5th to [ 698.6 cent]. As a result, contrast of the sound of major 3rd becomes much mild than ” Bach’s Seal 2.0″. You can’t expect the same strict and solemn sound of the original [697.2]. But on the other hand, the Pythegorean 3rd (408 cent ) is changed to [ 404 cent ]. This solves the problem of the unfamiliar 3rd with lots of howlings. The naming of “1.0” comes from this 5th 701 cent. Very Well 1.0 is my original tuning system. When the 5th get closer to the equal temperament 5th [700 cent], we can enjoy the sound in much lighter contrast. Even though the contrust gets lighter, if you listen carefully, you can hear the trace from Renaissance to modern time. Also you can enjoy this tuning system as a secret seasoning of equal temperament. This is also useful for early music. * Design of the the seal is a replica. I drew the initial J.S.B. clearly so that it would out stand. The color on the pearl of crown links with the graph design.